1. 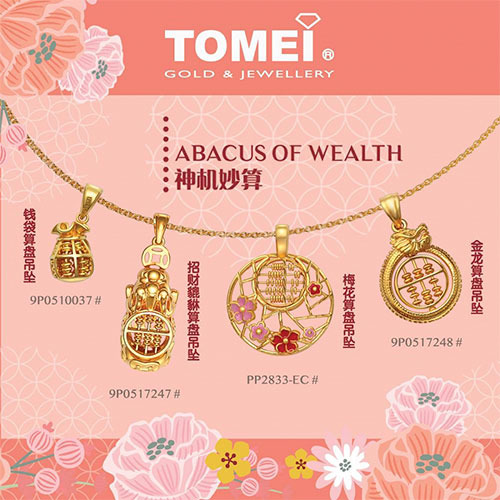 This Chinese New Year, let Tomei's Abacus pendants in 916 yellow gold combined auspicious elements of Pixiu, Plum Blossom, Golden Dragon and Fukubukuro Lucky Bag aid in your ability in obtaining and keeping wealth. - Abacus, a symbol of good fortune, abundance wealth and opportunities. - Plum Blossom, a symbol of perseverance and strength. - Pixiu, a symbol of the acquisition and preservation of wealth. - Golden gradon symbolises prosperity and wealth. - Fukubukuro, a portmanteau of the words for 'good fortune' and 'bag'.